I've got my Guess Shirt and Guess Jeans on and I'm ready to head over to see Expose' on the Videopolis Stage at Disneyland, anyone else want to join in? The Commodores on the River Stage! Richard Marx, the Harry James Orchestra and More! Can it get any better? In 1987 Disneyland stayed open until 3:00am. This year at Disneyland they are open until 2:00am (1:00am for California Adventure). All those closing times seem late to me, I'll be at home and asleep already! What a grand line up don't you think? Do they still have this many famous acts in one night? (Don't laugh, Expose' was famous for about 20 minutes, and don't laugh again, it's the first CD I ever bought!) 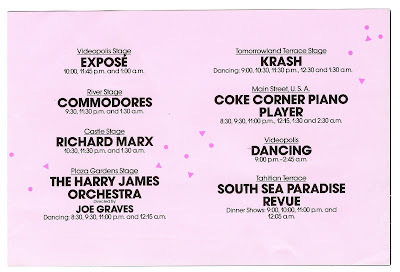 I have no idea who "Krash" was, maybe they were a cover band like "Reunion" that plays there now. Ah the Tahitian Terrace is still open, I wonder if the "South Sea Paradise Revue" was any good? And just because this post needs some color and cheer, here is a picture I took Friday night of Dumbo in action. It's an amature attempt, but I think it sets the right mood for the holiday's. Speaking of Friday night (see Saturday's post) I hear from a highly reliable source that the Friday after Christmas and before New Years is record breaking in attendance, a few years back they had over 100,000 people between both parks, that's A LOT of people! Everyone please have a safe and Happy New Year! See you on the other side of 2007! I dig the Seahorse Logo, check out an old guide book full scan here. This Junior ticket isn't dated, but I am guessing its newer than 1959, notice it's not on safety paper. Plus I think there are some of these still left to purchase, in fact I am sure of it. Check out Bob's Travels' current auction on EBay (link). I bought these exact ones your looking at from him. I've actually gotten some great deals from him, check his other stuff too! I wonder what would cause them to refuse you admission? 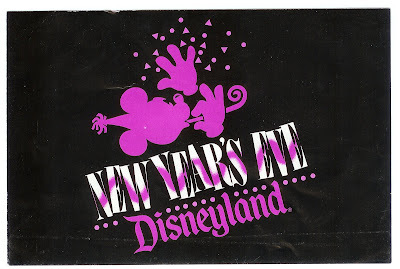 Tomorrow join us and bring in the New Year of 1988 at Disneyland! 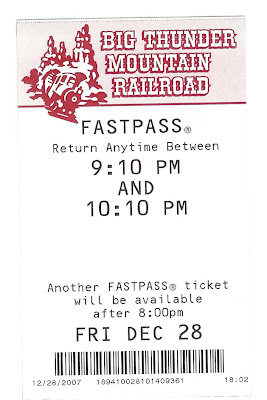 The only thing Vintage about today's post is me and how long I had to wait in line last night to get this Annual Pass! It was well worth it however, it's my first pass and I plan to use it plenty. I arrived at the park at 5pm, somehow I thought I could just pop in and get my AP then lazily roam around Disneyland, taking in the nice crisp winter air, fat chance! The park was as crowded inside as I have ever seen it, ever! Just as the Parade was ending (along with my patience) I got a Dole Whip to go and then started to head down the right side of Main Street to leave. It was then that the crowd control CM's started pointing everyone going south around to the right side of the Coke Corner and BEHIND Main Street. And here is a land I thought was gone forever. The "Vast parking Lot Land" Since I arrived at 5pm, I got my first chance to see the roof parking (I usually arrive before the park even opens). It's massive up there. On my walk (or more like a "journey") back to my car, it almost felt like the old parking lot. Here is a shot from where I parked, it's about as far a you can get from the escalators/elevators. I hope everyone had an outstanding Christmas this year, I sure did. I got a Premium Annual Pass to Disneyland from Santa! I guess I've been more nice than naughty! Since I am feeling so merry, we have 8 "E" tickets for your viewing pleasure on this post. Picking up a couple of years from where we left of on Part 4 of the "E" Ticket, this June 1975 "E" is the new smaller size. Although I am not a big fan of the "little" tickets, they are still the real deal and lots of fun to look at. America Sings has its proper place on the "E". I thought America Sings was the ultimate show when I was 10 years old, I still do. I ride Splash Mountain today just to see my friends in the scene at the end. There is a great two part video on You Tube of America Sings last show on April 10th, 1988 (link). Missing; Frontierland! The Pack Mule trails are already showing two years of over-growth, I bet this area was starting to look a little too "rustic" by this time. And the Mine Trains have moved to the "D" ticket for its last few years. I like the lower even serial number on this one. Tomorrowland opened "Space Mountain" on May 27th, 1977. Certainly a mega hit attraction if ever there was one (so much so there are five of them around the world). 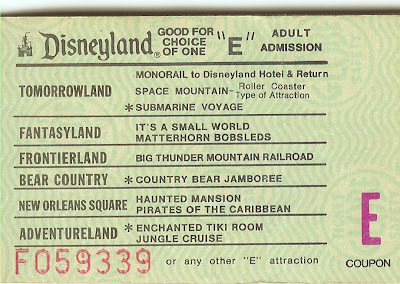 Obviously an "E" Ticket attraction from its first appearance on this pair of May 1977 "E" tickets (One Adult and One Junior, they are they same size, my scanner is possessed!). American Sings has already moved on to the "D" ticket. Was this move due to the huge capacity of the attraction and an attempt to keep it full. I seem to recall it being pretty busy thru the 70's. 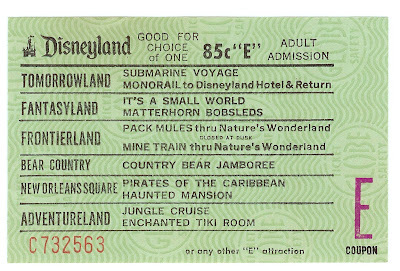 A slight change can be seen on this "E" ticket from June 1978. Apparently people did not know that Space Mountain was indeed a "Roller Coaster Type Attraction". I knew what it was from day one. What could people have thought it was? I guess because you couldn't actually see the track or cars until you are in the big launch room (actually I remember there used to be smoked glass that you could kinda see the ride before you got to the big room) Either way, there was and still are a few "Chicken Exits" anyway, so why the warning? Lawyers I bet! This is also June 1978 "E". However, this is from those "Complimentary" books. Weird serial number on this one, nice and low, but what is the RX part? I've been told by a reliable source that the "X" serial Numbers were for cast member give aways, I wounder what RX was for? May 1979 finds the Lawyers at work again. 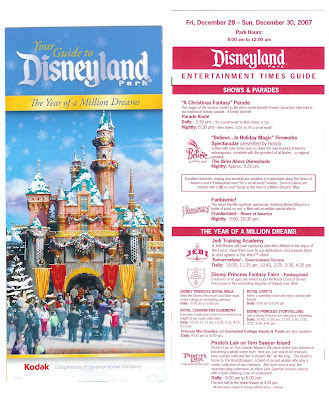 No attraction changes, but notice the asterisk * in front of some of the attractions. 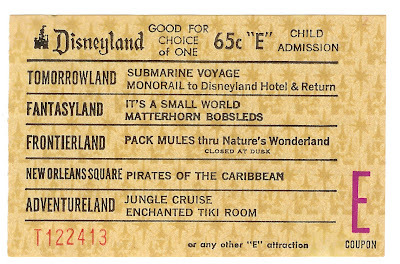 These are the attractions (as noted in the back of the ticket book - see next scan) were "Children under seven must be accompanied by an adult on most attractions except those marked by an asterisk (*)" It seems to me the Submarine Voyage is one attraction you would NOT want your 3 year old to ride alone, how about the Tiki Room? Am I the only person who finds this odd? Frontierland is back, and with an all new Attraction. Opening September 2nd, 1979 Big Thunder Mountain Railroad raced and roared thru what was once Nature's Wonderland. 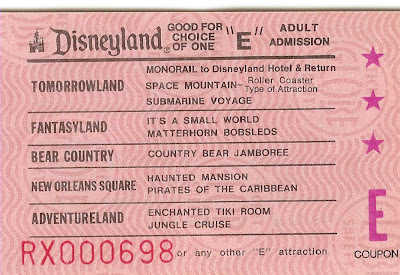 This is also a "Roller Coaster Type of Attraction", maybe they just ran out of room on this rather full May 1980 "E" Ticket to tell us that fact. Last of the line, call it day, the fat lady has sung... 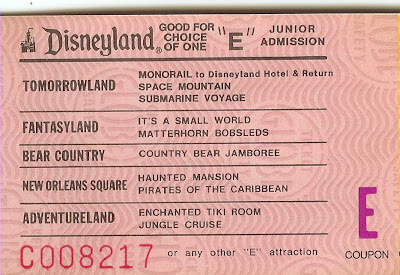 This September 1980 Child Admission "E" ticket is the latest (or newest) I have found. They may have printed Lettered ticket books in 1981, but I have yet to see any. That Globe paper is bold as ever! 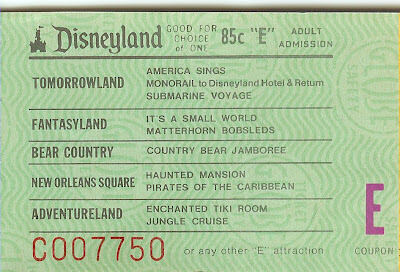 If Disneyland had left the Country Bear Jamboree in place (like they should have) every attraction on this 1980 "E" ticket would still be at Disneyland! Well that does it for our trip thru the ages with Disneyland lettered tickets. I hope everyone out there enjoyed as much as I did. I know it can be a little dry to some people (I read technical manuals just for fun, so there's not too much I find dry). I have LOTS more to post, research and talk about. I have Tons of tickets to show everyone still and Lot's of other unique tickets and ticket related items to share. And some just cool Disneyland stuff to show as well. 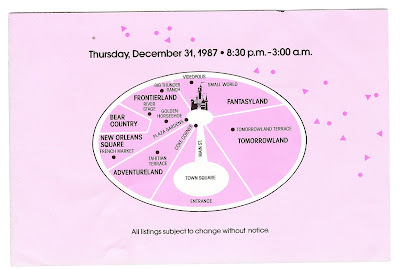 Maybe I should have called my Blog "Vintage Disneyland Ticket and Stuff"! Plus for you Knott's and Magic Mountain fans, check on weekends, I have decided to post about Disneyland's neighboring parks at least once a weekend. Merry Christmas Everyone! I hope you all have a safe and happy holiday. See you back soon for the Final part of the "E" ticket series! 999 Ghosts have arrived at Disneyland, they've moved into the Haunted Mansion! 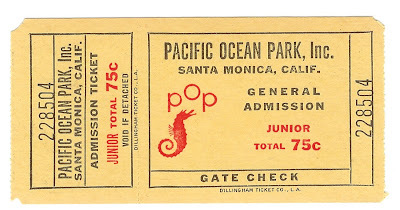 Obviously this was an "E" ticket attraction from the beginning and still is today. 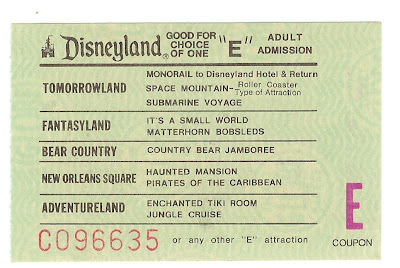 This May 1970 "E" ticket is the first ticket I can find with the Haunted Mansion listed. The Sailing Ship Colombia and the Mark Twain Steamboat have traveled to the "D" ticket, where they will remain thru the end of the lettered ticket. The Mine Train is back on the "E" Ticket, where it will stay until arriving on the "D" ticket in June of 1974! Also, notice the ticket price increase to 85 cents! Side note: Adult and Junior tickets always showed the same individual ticket price (even though the Junior book was cheaper than the Adult book), only the child's tickets showed the lower amounts. This Child's "E" ticket is from September 1970, the only change from May 1970 is the absence of the Pack Mules thru Natures Wonderland. It's not listed in the back of the ticket book either, was it gone for the Winter, it comes back next year. 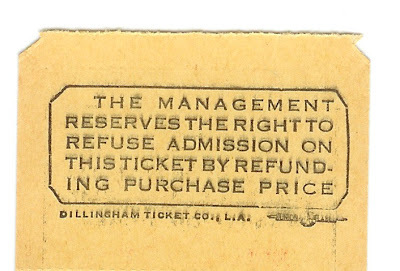 And last today, from April 1973, this is the last of the larger style tickets. A final appearance for the Pack Mules thru Nature's Wonderland, packing up for good... And what's this? A NEW land for Disneyland! "Bear Country" add's a sixth realm to "E" ticket, making for plenty of choices. The Country Bear Jamboree is all new, and it's one of the attractions I sorely miss, there was NO reason to removed this attraction, don't even get me started about that stupid pooh ride that belongs in Toontown! 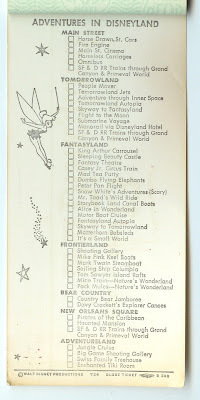 Here is the "Adventures in Disneyland" attraction list from the back of the April 1973 book. WOW, this is the Disneyland of my childhood, can I go back to Disneyland of 1973 for just one afternoon??? This is the back cover of the April 1973 book. This is the last of the larger size book and last of the better quality paper and dual color printing. 1974 brings thin non-glossy single color back covers! Mom is visiting for the Holiday's so I'm going to skip a few days of blogging. Fear not, I shall return soon with the final part of the "E" Ticket series! The great Castle Paper is back! I really am starting to like it. These are the first of the shorter length ticket, were the "A" tickets are now the longest (link). May of 1967 Saw many changes to the "E" ticket, so many we're going to need a chart to break it down. 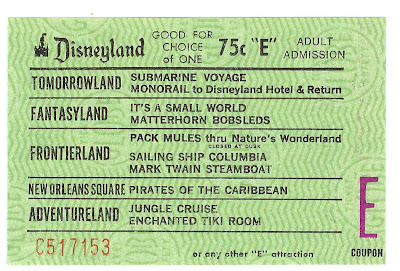 "Mark Twain" here she comes down the Rivers of America, heading right to this May 1968 "E" ticket, with her sister the Sailing Ship Columbia right behind her. They will spend two glorious years on the "E" ticket, then they set sail back down river to the "D" ticket. 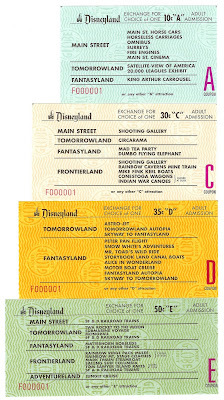 May 1969, no changes to report, I just wanted to show the three colors of the "E" tickets again, they are pretty don't you think? 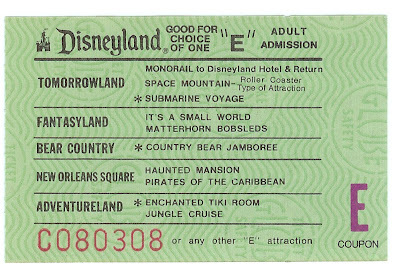 Plus this is the last "E" ticket before the "Haunted Mansion" makes it's ghostly appearance. And I am just tossing this in because I like the Art work. 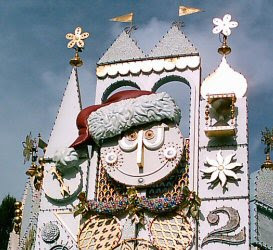 It's not dated, but it looks to be from the early days of It's a Small World. I am not a big fan of the ride, I seem to like the concept art and renditions better than the actual ride, anyone else? Tomorrow we'll look at the "E" ticket - 1970 to 1973, last of the larger size tickets. Included with the new DVD: Disneyland - The Secrets, Stories and Magic of the Happiest Place on Earth is a fantastic replica ticket book of the first 1959 "E" Ticket book. Get the DVD just for the ticket book! OK, yes, the DVD is amazing too, I've watched it twice already! Here is the front of the 1959 Replica ticket book. It looks great! Here is the view after you open the front, classic and very nice. The Welcome message is perfect, the purple-ish color is correct, sweet! The Globe paper is also perfect on these tickets, with the "D" yellow being particularly accurate. This is the replica "B" ticket. The first thing I noticed is the serial number is in the wrong place, they got it right on the rest of them! Also, this is not the correct lineup for 6/59. This is more correct for early 1960 or a second run in late 1959, when the Horseless Carriages and Omnibus were moved to the "A". 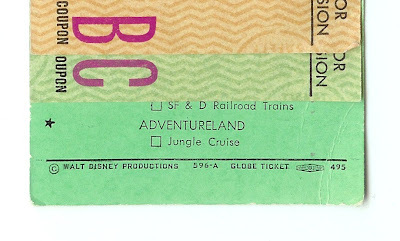 From June 1959, this real ticket this is the first "B" from the ABCDE series. Here's a run down of the other lettered tickets from the replica book. See Monday's post for a closeup of the 1959 "E" Replica. The Globe paper is vivid and luscious on this "D" ticket replica, with the back having the correct Globe watermark bleed-thru that this color and some of the other would colors have. Lame legal warning on the back! I can see this on the admission ticket, but the lettered tickets? This is the replica Back of the book. Very nice detail, I swear that little stain on the lower left was there when I opened it! This is a real June 1964 back of the book, pretty close to the replica isn't it? Only a 50 cent increase in 5 years! The only thing that is kind of a bummer is that the replica book only has 5 tickets in it, one of each letter. It is supposed to have 15! Oh well, I'll just have to get more! Tomorrow, back to the "E" Ticket - Part 3 the late 60's! Today lets look at the three different colors the "E" ticket was printed on. 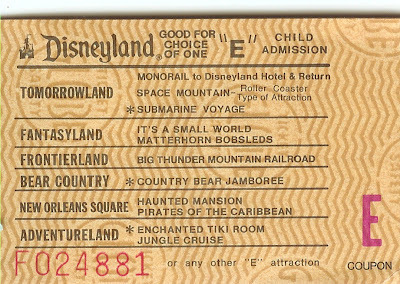 Going back a couple months from where we left off yesterday, this June 1962 "E" child ticket is I guess "tan" in color. There is a little bit of smearing on the ink on the word "thru" for the Mine Train, that's fairly rare. Generally, all of these tickets were printed even and consistent, pretty amazing since it was obvious they would only be used once. As you can see they have held up well for over 40 years. Back to Basic Green for June 1964! Papotin's Revue has packed up and move on. And I guess the Fastasyland Station is open but not on the this ticket. Maybe they knew it was going to close soon. 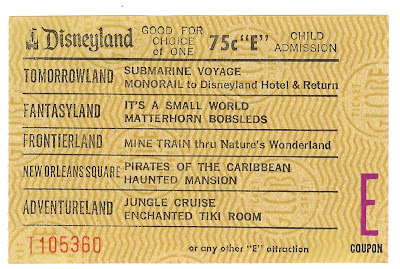 And we'll finish off today with a June 1965 "E" Ticket sporting a new price of 60 Cents! 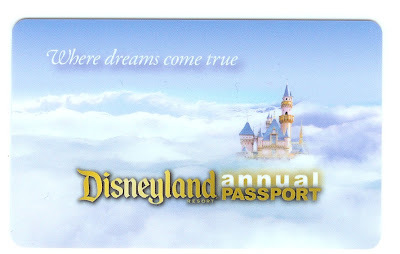 (Special ticket book price 43 cents, you saved 17 cents using Disney's ticket book plan!) Great Moments with Mr. Lincoln is all new to Disneyland, and it will cost adults one of these precious "E" tickets. As we learned in the "C" ticket series, Juniors and Children originally got a separate ticket in their book that let them see the show for free. I love this little detail about the free shows, I like to think Walt wanted to be sure the younger generation saw this show. Tomorrow; We'll take a break from the "E" ticket series and have a review of the Replica 1959 Ticket Book from the new Disneyland Secrets DVD. Well we finally made it, the "E" Ticket! Let's look at what caused the "E" ticket to happen in the first place. 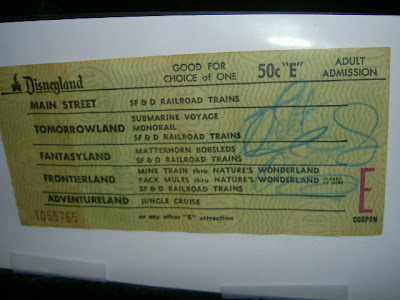 As we learned in the "A" Ticket series, the first lettered ticket books only had A-B-C Tickets. This was from October 1955 thru the first half of 1956. 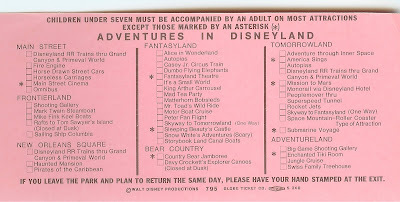 By the summer of 1956 many new attractions had been added to Disneyland, therefore the "D" Ticket was introduced. Did this make Disneyland more money, I bet somehow it did. For the summer of 1959, "Disneyland 59" was getting all kinds of cool new attractions. 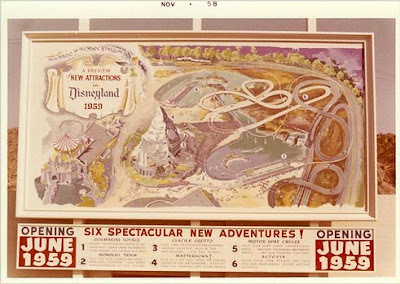 "Six Spectacular New Attractions!" Check out this cool clip of the Disneyland 59' TV Special, this clip actually looks cleaner and sharper than the Disneyland Treasures DVD version I bought, Hmmmm? Maybe it's just because it's smaller. 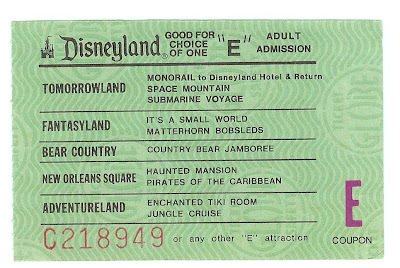 With so many new attractions, there was no way to fit them all on the A-B-C-D tickets, so Disneyland gave us the now famous "E" Ticket. 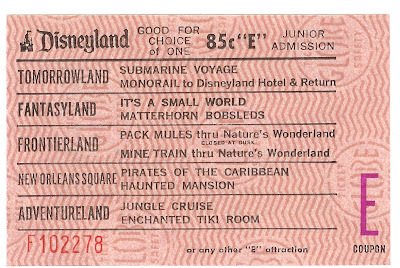 Three of the Six new attractions in 1959 would be on the first "E" Ticket, along with Walt's best of the bunch. From June 1959, the first "E" Ticket had a great line-up indeed! The SF & D Railroad, with all four stops! TWA Rocket to the Moon. The New; Submarine Voyage, Monorail and Matterhorn Bobsled. Rainbow Mules and Coaches, the Mark Twain & Columbia, Tom Sayer Island Rafts, and the Jungle Cruise! 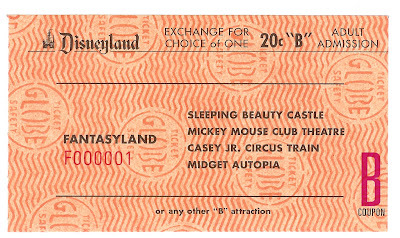 This is a Replica 1959 "E" Ticket from the new Disneyland Secrets DVD. These are really nice. To my surprise, this is real globe paper and the colors are good. Check later this week for my full review of the replica ticket book. Here we have a June 1960 "E" Ticket with no TWA Rocket to the Moon, its been demoted all the way down to the "C" ticket, I wonder why it didn't just drop to the "D" ticket? 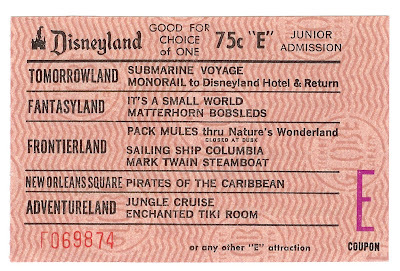 Speaking of the "D" ticket, the Mark Twain and Sailing Ship Columbia both sailed down to the "D" ticket in 1960. Also notice the upgrade to the Mine Train and the Pack Mules, they now go thru Nature's Wonderland! (Pack Mules closed at dusk). Check out this June 1960 "E" ticket that sold on EBay for $405!!! There was no authentication for Walt's signature. Do you think it's real? Looks pretty good. If it's fake, this ticket is worth about $15 to $20. This is the only "E" ticket I have from 1961, so try to ignore the poorly torn perforation on the left side. A couple of neat changes have occurred. The SF & D Railroad Trains now go thru Grand Canyon Diorama and the Fantastyland Station is gone but returns in 1962. And see the Monorail, by 1961 the line was expanded and now it goes to Disneyland Hotel & return. That's it for today's post, tomorrow we'll pick back up in 1962 and check out the other colors the "E" Ticket's were printed on.